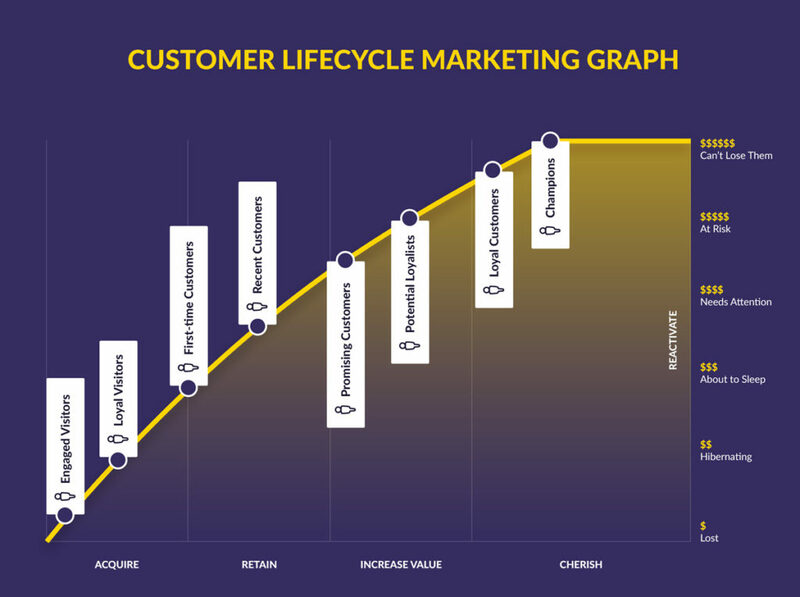 Why is Customer Lifecycle Marketing Important? If you Google “Customer Lifecycle Marketing” or “Customer Lifecycle Management,” you’ll come up with a number of different results. There is no hard and fast rule for what makes up a Customer Lifecycle, largely because many marketers are still trying to figure it out. The Customer Lifecycle is a way of describing the different stages a customer goes through during their interaction with your brand. Customer lifecycle marketing describes the process of marketing to customers based on the stage they are in. You want to address your customers based on the stage they are in at the time of your message. That way, you can communicate in a way that’s meaningful for them personally. You can target them with tried and tested campaigns that have worked for that stage before, preventing churn, or increasing their customer lifetime value. One final thing to keep in mind is that the customer lifecycle is non-linear. While graphic representations show a progression of stages toward an ideal customer, users may skip stages depending on their activity. Back in the year 2000, NetGenesis and Target Marketing published E-Metrics: Business Metrics For The New Economy. The white paper detailed the idea of the customer lifecycle, and how to use it in the still maturing industry of E-Business. The authors discuss the business cultures of the past, and how we have now shifted to a customer-centered economy. The first half of the 20th century focused on mass production, led by Henry Ford and his assembly line. In the second half of the 20th century, business culture began focusing on the importance of distribution, something Sam Walton conquered through transportation and logistics. The rise of the Internet led to a new area of importance. The authors of E-Metrics identify that the beginning of the 21st century shifted the focus of business culture to the importance of knowledge about individual customers, led by Jeff Bezos of Amazon. Customer lifecycle management is as important to business today as the assembly line was to business in the 1900s. A customer lifecycle provides marketers with the framework for communicating with customers at each touch point in their interaction with your brand. Campaigns can be automated and personalized like never before, and companies ignoring this will be left behind. Exponea’s customer lifecycle model is based on thousands of hours working with e-commerce sites, and enhanced with detailed user data that we used to create a custom RFM analysis for customer lifecycle segments. We then break those stages down further to create 14 customer segments, using an RFM analysis for the traditional 11 segments (this article contains a good representation of the 11 segments and their corresponding RFM scores), and simple segmentations for the three added segments of Engaged Visitor, Loyal Visitor, and First-Time Customers. ACQUIRE – Bring new traffic to the site and convince them to make their first purchase. Who they are: Users who visit, but don’t purchase or leave an email. What your goal is: Secure a communication channel with the customer. Banners promoting Unique Selling Propositions of the site. Limited-time vouchers for first purchase. Who they are: Users who don’t purchase, but have left an email. What your goal is: Get them to make their first purchase. Email with fresh sales right after visit. RETAIN: Get your new customers to make another purchase. Who they are: Customers who have made one purchase. What your goal is: Ensure their experience is positive enough for a 2nd purchase. Send feedback surveys; offer vouchers to complete them. Who they are: Customers who purchased recently, but haven’t purchased often. What your goal is: Ensure a positive post-purchase experience. Ask for product reviews and provide incentives. Give vouchers for their friends. Offer to provide reminders for items they may purchase again soon. INCREASE VALUE: Upsell your retained customers to increase their frequency and average order value. Who they are: Customers who make periodic purchases, but spend little. What your goal is: Slowly increase their frequency of orders and/or monetary value. Upsell them with limited-time offers. Incentivise higher spend with bundle deals. Who they are: Customers who have made recent purchases, spend a good amount, and order often. What your goal is: Similar to Promising; continue increasing the frequency and monetary value of their orders. Offer priority shipping as a thank you. Continue to incentivise higher spend with bundle deals. Who they are: Customers who spend a lot and are responsive to marketing communication. What your goal is: Keep them happy and upsell them toward Champion. Send a gift voucher with a personal note and a team photo. Who they are: The best customers. They spend the most and spend often. Reward them with access to new products first. Include the occasional gift in their orders. Have customer care call them personally when communication is needed. REACTIVATE: Bring back lapsed customers. Focus your attention and resources on the most valuable ones. Who they are: Former Champions who have stopped purchasing. What your goal is: Use whatever you have at your disposal to bring them back. These are the big customers that you DO NOT want to lose for good. Send them store credit to get them purchasing again. Call them directly to ask why they’ve stopped shopping with you. Who they are: Previously high value customers who have recently stopped purchasing. What your goal is: This group needs a push to get them back to purchasing; act now before they lapse completely. Send a personal note to re-engage them along with a small gift. Send exclusive offers just for them. Who they are: Customers with above average frequency and monetary value, but who haven’t purchased recently. What your goal is: Similar to At Risk, but with less money behind your reactivation campaigns. Email them directly to ask why they’ve stopped shopping with you. Send exclusive offers that are less valuable than those sent to At Risk. Who they are:Low-value customers who haven’t purchased recently. What your goal is: Keep these customers without spending more than it’s worth. Re-engage them on social media. Use the same campaigns as Needs Attention but with less budget. Who they are: Low-value customers who have stopped purchasing. What your goal is: Worth reactivating, but don’t spend too much time or money. Send them a reactivation newsletter. Retargeting campaigns on social media. Who they are: Lowest-value customers who have stopped purchasing. What your goal is: Worth reactivating, but spend even less time or money than on Hibernating. First, run an RFM analysis on the data in your Customer Relationship Management (CRM) system, and group your customer base into the segments described above. Now you can start designing campaigns for each segment (see our recommended use cases in the graphic above). a database with profiles for every individual user, detailing their interests, purchase history, site activity, etc. The more frequently your single customer view updates your customer data, the better. Otherwise you risk customers receiving communication meant for a segment they no longer belong to, or not receiving communication meant to prevent churn until it’s too late. Finally, you need a way to A/B test your campaigns to make sure they’re working. Make sure your testing software is quick and easy to use, as you will have a lot of campaigns to test. Even though the solutions we recommend have worked for us, there’s no guarantee they will work for your business. You should always be testing your campaigns. Be sure to also define a global control group that will never be targeted by campaigns so you can accurately understand each campaign’s value. As described above, you can deploy this lifecycle management plan without using Exponea, but there are advantages to using Exponea, like having all aspects of your customer lifecycle marketing available in one program. Using Exponea, anyone can perform an RFM analysis of their customer base, and group the customers into the 14 lifecycle segments. No expertise needed. Within the same program, you can then design and run email, sms, push notification, and banner ad campaigns for each of the 14 segments. Our single customer view is updated in real-time: the second a customer does something that should place them in a different segment, they are moved automatically. If a customer starts to lapse, the reactivation campaigns automatically take over. The campaigns you create within Exponea will continue to run automatically for each continuously updated segment until you turn them off. It’s easy to A/B test your campaigns, because the testing is automatically built into the campaign designer. Try one use case on a particular group of Promising Customers. Try another on a second group of Promising Customers. And a third, fourth, fifth, however many you want. Compare them side-by-side in real time. Exponea also lets you define a global control group of your site’s users. This control group will never be targeted by the campaigns, allowing you to see how much value each campaign is actually generating. 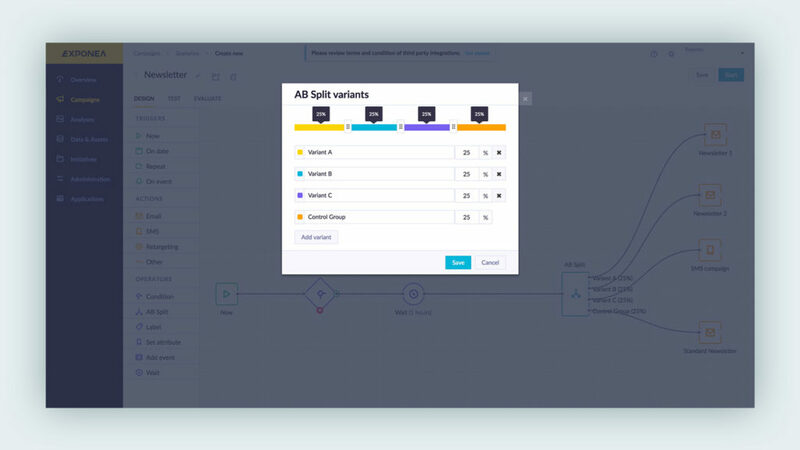 Finally, you can create an initiative that categorizes and groups all of your customer lifecycle campaigns, letting you easily keep track of which campaigns you’re running for each customer segment. 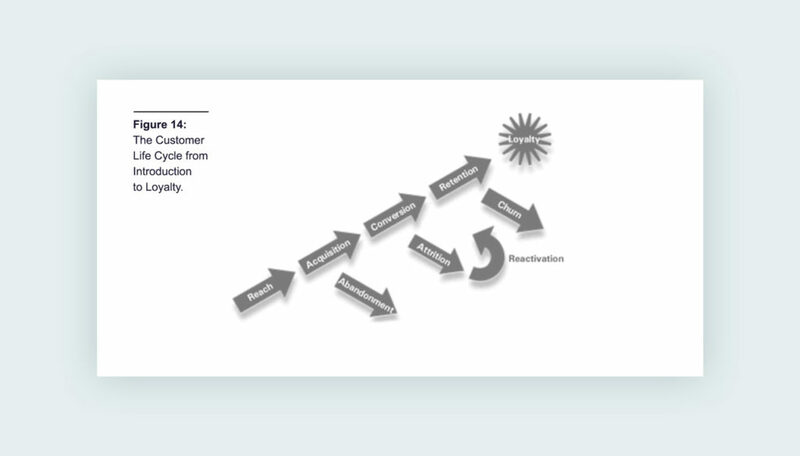 A Customer Lifecycle describes the stages a customer goes through. Customer lifecycle marketing describes the process of marketing to each stage. Exponea broke five lifecycle stages down into 14 segments to be targeted individually. The customer lifecycle is non-linear: a user can skip segments. Your lifecycle campaigns should target users based on their segment with specific campaigns that have succeeded in that segment before. Would automated customer lifecycle marketing campaigns increase the value of your customers? Let’s find out.